The following diagnostic steps will help prevent overlooking a simple problem. This is also where to begin diagnosis for a no-start condition. The first step in diagnosing any driveability problem is verifying the customer’s complaint with a test drive under the conditions the problem reportedly occurred. Before entering self-diagnostics, perform a careful and complete visual inspection. Most engine control problems result from mechanical breakdowns, poor electrical connections or damaged/misrouted vacuum hoses. Before condemning the computerized system, perform each test listed in this article. voltage tests with a Digital Volt-Ohmmeter (DVOM) having a minimum 10-megohm input impedance. Visually inspect all electrical wiring, looking for chafed, stretched, cut or pinched wiring. Ensure electrical connectors fit tightly and are not corroded. Ensure vacuum hoses are properly routed and are not pinched or cut. See M - VACUUM DIAGRAMS article in the ENGINE PERFORMANCE Section to verify routing and connections. Inspect air induction system for possible vacuum leaks. Check engine mechanical condition with a compression gauge, vacuum gauge or engine analyzer. See engine analyzer manual for specific instructions. WARNING: DO NOT use ignition switch during compression tests on fuel injected vehicles. Crank engine with a remote starter. Fuel injectors on many models are triggered by ignition switch during cranking mode, which can create a fire hazard or contaminate the engine’s oiling system. NOTE: Compression pressure and cylinder pressure variation are not available from manufacturer. The exhaust system can be checked with a vacuum or pressure gauge. Remove O2 sensor. Connect a 0-5 psi pressure gauge and run engine at 2500 RPM. If exhaust system backpressure is greater than 1 3/4 - 2 psi, exhaust system or catalytic converter is plugged. If a vacuum gauge is used, connect vacuum gauge hose to intake manifold vacuum port and start engine. Observe vacuum gauge. Open throttle part way and hold steady. If vacuum gauge reading slowly drops after stabilizing, check exhaust system for restriction. Basic diagnosis of fuel system should begin with determining fuel system pressure. Fig. 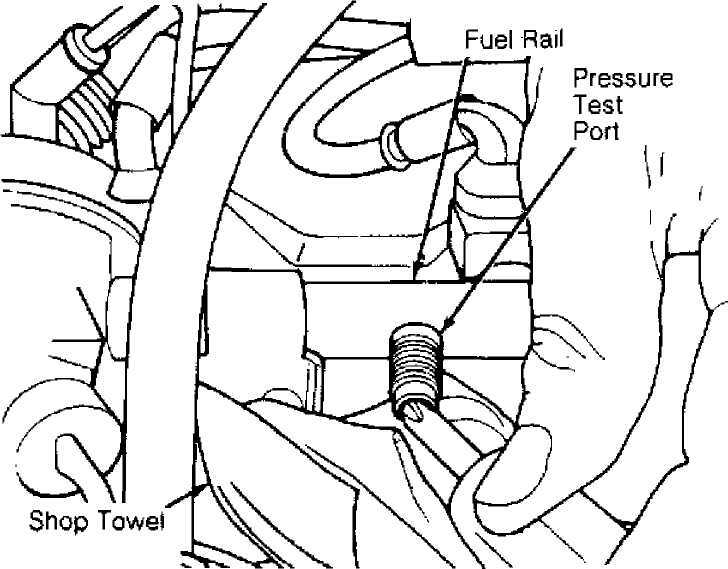 1: Releasing Fuel System Pressure Courtesy of Chrysler Corp. Disconnect negative battery cable. Remove fuel filler cap. Remove cap from pressure test port on fuel rail. Position shop towels to soak up any spilled fuel. Using a small screwdriver or pin punch, push test port valve in to relieve fuel pressure. See Fig. 1. Install cap over test port. Reconnect negative battery cable. RELEASE. Connect a 0-60 psi (0-4.2 kg/cm) fuel pressure gauge to the pressure test port fitting on fuel rail. pressure test port fitting on fuel rail. for cause of no vacuum. on pressure gauge. Shut engine off. regulator, fuel pump check valve or fuel injectors. and Wrangler or Pink wire on Grand Cherokee in PCM harness connector. ground the wire. Fuel pump should work. is present at relay terminals No. 30 (battery) and 87 (fuel pump), and at fuel pump. See Fig. 2.
are okay, replace fuel pump. is present at relay terminal No. 86. See Fig. 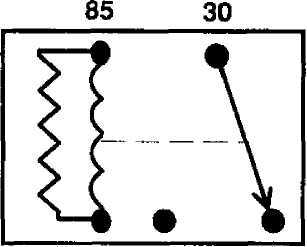 2.
in step 2), check resistance between relay terminals No. 86 and 85.
harness connector. Connect battery cable. Check fuel pump operation. article in the ENGINE PERFORMANCE Section and check PCM. Fig. 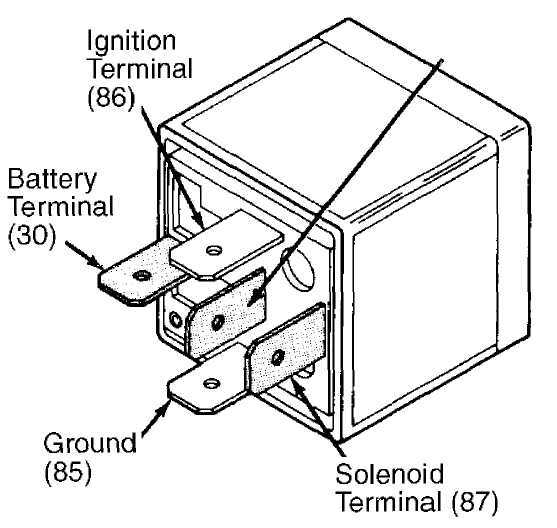 2: Identifying Fuel Pump Relay Terminals Courtesy of Chrysler Corp.
wire resistance. Perform IGNITION PRIMARY test under IGNITION CHECKS. plugs. Repair or replace if necessary. Spark Plug & Coil Wire Resistance Resistance should be 250-1000 ohms per inch. Remove primary and secondary leads from ignition coil. terminals of coil. 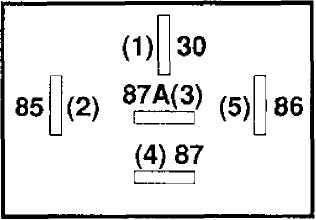 See IGNITION COIL RESISTANCE table. negative terminal of coil. See IGNITION COIL RESISTANCE table. Replace coil if readings are not within specification. NOTE: Perform SECONDARY SPARK under IGNITION CHECKS before proceeding with test. connections are clean and tight. wire Grand Cherokee). Touch negative lead to Black/Light Blue wire. position sensor is okay, but engine does not start, see G - 2.5L & 4. If no faults were found while performing BASIC DIAGNOSTIC PROCEDURES, proceed to G - 2.5L & 4.0L TESTS W/CODES article in the ENGINE PERFORMANCE Section. If no hard codes are found in G - 2.5L & 4.0L TESTS W CODES, proceed to H - TESTS W/O CODES article in the ENGINE PERFORMANCE Section for diagnosis by symptom (i.e., ROUGH IDLE, NO START, etc.) or intermittent diagnostic procedures.